The Alpine A110 is a refreshing tonic to Teutonic rivals. Agile, fast and gorgeous to look at, it almost justifies its hefty price tag. Few cars have been as eagerly awaited, or had such a troubled gestation, as the Alpine A110. Bravely pitched as a rival to the sublime Porsche Cayman, the French machine originally started out as a joint venture between Renault and Caterham, but a struggle with finances meant that La Regie took the project in-house. Developed with an obsessive attention to minimising mass and a uniquely French approach to chassis tuning that manages to make the car both sharp and supple, the Alpine is a genuinely different proposition to the Cayman, but no less thrilling as a result. Like the Porsche, the A110 is powered by a four-cylinder engine, but while the turbocharged 1.8-litre in-line unit’s 247bhp might not seem much on paper, in a car weighing just 1103kg and with spring gearing it makes for a scintillating turn of speed. It’s so rapid that you’ll even forgive it a lack of a manual gearbox and the fact the seven-speed twin-clutch unit isn’t the snappiest shifter. Most remarkable is the way the Alpine goes down the road. Where many rivals pummel the tarmac into submission, the A110 glides serenely over it, working with the surface rather than against it. Quick steering and that mid-engined layout engender real agility, while outright grip levels are high. And given the softness of the set-up it’s surprising how controlled the Alpine is….up to a point. Push really hard and the car can feel a little ragged, but drive within its limits and its unique approach to going quickly has to be enjoyed and admired. Perhaps crucially, it’s possible to forgive a few flaws when a car looks this good. Compact, delicate and with just enough injection of retro, the Alpine looks stunning in the flesh. The cabin’s not quite as successful (the driving position, even with the seats bolted into their lowest position, is hopeless) and struggles to justify the A110’s near-$66,000 price tag. That’s a lot of cash, but the lissom Alpine just about gets away with it. You can’t fault Renault’s ambition with the Alpine, with the flagship Légendemodel setting you back a hefty $67,050. And you’d hardly call the entry-level Pure model a snip at $61,910. Yes, both versions are extremely well equipped, but it’s a chunky amount of cash for what is essentially a four-cylinder coupe with a two-decade gap in its heritage. By comparison, the entry-level Porsche 718 Cayman with its six-speed manual gearbox and 286bhp 2-litre will set you back $57,372, while adding the seven-speed PDK (a far superior unit to the Alpine’s twin-clutch) lifts the price to $60,012. Step up to the more powerful 2.5-litre S and you’ll pay $69,609 and $71,833 respectively for the manual and PDK versions. Of course, these prices are before options, meaning they’ll rise more than a little to match the Porsche and Alpine spec for spec, but as a complete sports car the Cayman just edges its more expensive rival. And yes, the flat-four engine is a bone of contention, but while it’s not the most charismatic unit, its main failing is that it’s simply not the old car’s flat-six – in terms of performance this punchy powerplant is in a different league. With 247bhp and 236lb ft available to propel the 1103kg Alpine it’s no surprise to find it’s a quick little car, with the 0-100kph sprint taking a claimed 4.5sec. When we tested the car we managed a best of 4.6sec to 100kph, which is a strong result given that all our assessments are run two up and with a full tank of fuel. Yet it’s the A110’s elastic mid-range acceleration that really impresses, the combination of lag-free turbo torque and relatively short gearing helping the Alpine set a scorching in-gear pace. Overtaking slower traffic is a doddle, the A110 simply firing by with a squeeze of the throttle. In real world situations the Alpine is probably as fast as you’ll ever need to go, zapping straights with an intent that’s genuinely surprising. Given its small dimensions and slippery shape, it’s no surprise to find the Alpine will easily hit its electronically limited 249kph. 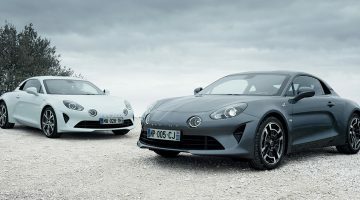 However, it’s light weight and the relatively high-set mid-mounted motor mean that at really high speeds the A110 feels flightier than the rock-solid Porsche Cayman. The A110 is powered by a new 1.8-litre four-cylinder engine with a single turbocharger and direct injection. It’s the same unit that’s used in the latest Mégane RS. In the fullness of time this engine is set to produce 300bhp-plus, says Alpine (in the forthcoming Mégane RS Trophy the wick has been turned up to 296bhp), but for now it offers 249bhp at 6000rpm and 236lb ft at just 2000rpm. Given its relatively humble DNA, the Alpine’s in-line four is a more charismatic companion than the Porsche’s flat-four. It’s a zingy little unit, responding crisply and quickly to the throttle, its rasping exhaust note egging you on, encouraging you to get it bouncing off the rev limiter. Ramping up the driver modes (there’s Normal, Sport and Track) adds some extra fruitiness to the soundtrack, with the pops and crackles on the overrun being particularly entertaining. Less impressive is the seven-speed gearbox. There’s nothing intrinsically wrong with it – it shifts swiftly and smoothly enough – it’s simply that the twin-clutch unit isn’t as incisive as you’d want in a sports car. Quick getaways are achieved by slipping the clutches, while there’s a similar feeling on fast changes, giving the impression that performance is being fractionally sapped. Still, you get a nice blip on downchanges, while it’s relatively painless when left to its own devices. Underpinning the Alpine is a light and strong aluminium structure, while the same material is used for the body panels, all of which helps the Alpine tip the scales at 1103kg. The car’s pure ethos is reflected in its suspension, which features unequal-length wishbones front and rear, coil springs and passive dampers – Alpine’s engineers wanted to avoid complexity and so adaptive items were dismissed. That classic set-up of double unequal-length wishbones at each corner and a lightweight aluminium body and frame means the A110 has all the credentials to deliver ride and handling greatness. But even so, the way in which it flows across the ground, ‘breathing’ with the road like only the best cars from Lotus did all those years ago, still comes as a very pleasant shock. The steering is light, delicate and accurate, but delivers genuine feel through the rim, in all of its modes. You place the A110 to the nearest millimetre through most bends and have total faith in the front end because the turn-in response is so crisp, without being hyper-reactive. This is a car that flows down the road, its minimal mass and soft suspension giving it a typically Gallic feel. You can hustle it, but it prefers to be caressed along, taking the line of least resistance. This is a sensation that’s enhanced by the ride, which soaks away bumps that others pummel into submission. Get it right and the Alpine manages the unique trick of both floating just above the surface and being intimately keyed into it at the same time. It’s not without fault, though. The damping isn’t quite there yet, lacking the fine control that really engenders confidence and encourages you to push on. It’s exacerbated by the perceived imbalance to the weight distribution, which feels as if the engine is set too high and too far back. Over fast flowing roads the Alpine takes on a subtle diagonal corkscrew motion as the weight of the car seems to fall over onto the outside rear wheel. It’s lovely at eight-tenths, but push on and it feels a bit flightier and less trustworthy. Given its impressive performance potential the Alpine actually delivers surprising frugality – and that’s largely down to its lack of mass. According to its own claims the A110 emits just 144g/km of CO2 and will return 6.4L/100km. That’s probably not far off the reality as we managed 8.2L/100km on our Super Test, which included fast road driving, performance figuring and setting a lap time. With real world use you can expect regular forays into the forties. Another benefit of the Alpine’s low weight is that it’ll be kinder to consumables, such as tyres and brakes, which is especially good news if you plan on taking your A110 on track. The rubber is a reasonable size, too, with 205/40 R18s at the front and 235/40 R18s at the rear. With low wear rates comes cheaper servicing costs, with only routine fluid changes likely for most scheduled maintenance. And because most of the oily bits are shared with run-of-the-mill Renaults you can expect prices to be reasonable – although currently only a select handful of dealers are authorised to work on the A110. Finally, strong demand and limited supply means you can expect not to lose too much financially when it comes to depreciation. Despite its relatively tiny dimensions, the A110 doesn’t feel small or cramped inside. Previous Alpine MD Michael van de Sande is a towering 6ft 7in tall and the car was designed to make sure even he fits in, so for anyone of remotely regular proportions there is plenty of room in which to operate. That said, the driving position is a little odd, with the steering wheel canted slightly like that of a bus, while the only way to adjust the seat height is with a set of spanners. At least the cabin is neatly styled, even if it isn’t as eye-catching as the exterior. It takes a minimalist approach, with all the major controls grouped into the central infotainment screen, which is slick-looking but frustratingly laggy and counter-intuitive to use. Ahead of the driver is a TFT dial pack that changes visual theme dependent on whether you’ve selected Normal, Sport or Track modes – each of which can be accessed using a button on one of the steering wheel spokes. Other driver aids include the Alpine Telematics function, which allows you to record and store lap times and performance data, plus it also delivers a number of real-time displays for parameters such as turbocharger pressure, various fluid temperatures and power and torque delivery. Quality is good, with some nice-looking and feeling materials used on the flagship Légende model, including leather and Alcantara. Yet some of the plastics give off a low-rent vibe and certainly aren’t in keeping with a car that weighs in at as much as $66,000. And while the cabin is roomy, the boot is cramped and suffers from relatively poor access. Alpine wanted to keep the aesthetics of the A110 as clean as possible, hence the lack of a rear wing. 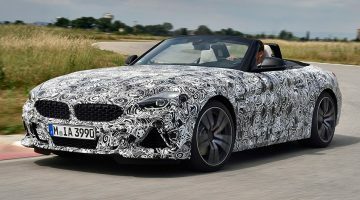 Instead, there is a functional rear diffuser and some clever aerodynamics at both ends that help generate the required stability at high speed while reducing drag at all speeds. Most of the work is done by the air that flows underneath the car. The result is that the Alpine looks simply sensational from almost any angle. For starters, it’s surprisingly compact – it’s 4180mm long and just 1252mm high – and is dwarfed by the likes of a Porsche Cayman and Audi TT. Its flowing design draws heavily on the original ’60s A110 but with enough injection of modernity to keep it looking fresh and relevant. It’s a lithe and slinky-looking car that turns heads as readily as supercars costing three or four times as much. Customisation options are thankfully few and far between at the moment, with the choices limited to a variety of alloy wheels. 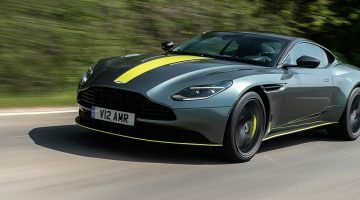 2018 Aston Martin DB11 AMR review – a better car, but is it a better DB11?